Adult stem cells appear to be a promising subject for tissue engineering, representing an individual material for regeneration of aged and damaged cells. Especially adipose derived stromal cells (ADSC), which are easily to achieve, allow an encouraging perspective due to their capability of differentiating into miscellaneous cell types. Here we describe the in vitro formation of human subcutaneous, visceral and omental ADSC micromasses and compare their histological attributes while being cultivated on collagen membranes. Subcutaneous, visceral and omental fat tissue derived cells were isolated and processed according to standard protocols. Positively stained cells for CD13, CD44 and CD90 were cultivated on agarose in order to study micromass formation using a special method of cell tracking. Stained paraffin-embedded micromasses were analysed morphologically before and after being plated on collagen membranes. The micromass formation process was similar in all three tissue types. Subcutaneous fat tissue derived micromasses turned out to develop a more homogeneous and compact shape than visceral and omental tissue. Nevertheless all micromasses adhered to collagen membranes with visible spreading of cells. The immune histochemical (IHC) staining of subcutaneous, visceral and omental ADSC micromasses shows a constant expression of CD13 and a decrease of CD44 and CD 90 expression within 28 days. After that period, omental fat cells don’t show any expression of CD44. In conclusion micromass formation and cultivation of all analysed fat tissues can be achieved, subcutaneous cells appearing to be the best material for regenerative concepts. Adipose derived stromal cells (ADSC) are multipotent cells well known in the literature. They occur in abundance, are easily to achieve and able to differentiate into miscellaneous lineages like osteoblasts, endothelial cells, or neurogenic cells without difficulties. These special characteristics contribute for the interest in using those cells for personalised tissue regeneration. Placed on scaffolds like collagen membranes these well-organised spheres could be implanted into tissue defects. The aim of the present study was to reveal the micromass-formation-potential of different hADSC types (subcutaneous, visceral and omental fat tissue derived cells) and to compare their histological attributes. Secondly we wanted to examine collagen membranes serving as scaffold for potential in-vivo application and related differences of subcutaneous, visceral and omental fat tissue derived micromasses in cultivation. Human omental, visceral and subcutaneous fat tissue declared as waste product was obtained under sterile conditions by the General and Visceral Surgery, University Hospital, Muenster (Germany). This procedure had been approved by the ethical approval board of the University of Muenster, Germany. Cells were isolated as described in our previous study. Each type of hADSC was obtained from three different and independent donors. Technical replicates were used in order to fortify results. Micromasses of 200,000 cells were used for morphological evaluation. Therefore, cells suspended in α-MEM (Lonza Walkersville; USA) were plated into agarose coated 96-Well plates for 7 days. Micromasses were cultivated at 37 °C with 5% CO2; medium was changed every 2–3 days. Analysis was performed with three biological replicates. hADSC micromasses were cultivated as described above. Collagen membranes (Resorba Wundversorgung GmbH & Co. KG, Germany) were cut to size of 0.8 cm × 0.8 cm and put into 8-well chamber slides (Nunc, Thermo Fisher Scientific, USA), filled with α-MEM. Single spheres were seeded on the soaked collagen. Micromasses were cultivated at 37 °C with 5% CO2, medium was replaced every 2–3 days. Micromasses were used for histological examination both exclusively and cultivated on collagen. Samples were fixed in 4% of buffered formalin (Fisher Scientific UK limited, UK) for 1 h and embedded in HistoGel (Thermo Scientific, Germany). Samples were watered for 1 h and dehydrated in an increasing alcohol series followed by incubation in warm cedar wood oil (Merck KgaA, Germany), warm paraffin - cedar wood mixture (ratio 1:1), and warm paraffin (Paraplast Plus) (Kendall, Tyco Healthcare Group LP, USA). After cooling down, samples were embedded into fresh paraffin for being sectioned with a microtome (Leica Microsystems GmbH, Germany). Sections were mounted onto slides one day before staining, and afterwards deparaffinized in xylene and rehydrated through decreasing grades ethanol solution. Primary monoclonal antibodies from mouse were CD13 (clone WM 15, dilution 1:100, Thermo Fisher Scientific, USA), CD44 (clone A3D8, dilution 1:100; Sigma Aldrich, Germany), and CD90 (clone AF-9; dilution 1:50; Thermo Fisher Scientific, USA). Dako REAL™ Detection Kit was used for secondary antibody detection (Dako, Germany). Haematoxylin was used for counterstaining (Sigma-Aldrich, Germany). Negative as well as positive controls were implemented according to manufacturer’s protocols. They were then examined utilising fluorescence microscope Axioplan 2 (Carl Zeiss, Germany). Staining results were summarised in a semi quantitative score defined as: 0 = no staining, 1 = staining in less than 30% of cells, 2 = staining in 31 to 80% of cells, 3 = staining in more than 80% of cells. Samples were analysed by three well-trained professionals with experience in histochemical techniques and analysis. Statistical analysis of semi quantitative score was carried out by one way ANOVA using a modified Levene testing and p < 0.05, and a PostHoc analysis with Bonferroni-Holm testing (Daniel’s XL Toolbox version 6.53; https://www.xltoolbox.net/. sourceforge.net). In order to analyse micromass formation, amounts of 5000 hADSC suspended in Leibovitz’s L-15 medium (Gibco/ Life Technologies, USA) were plated into agarose (Biozym Scientific GmbH, Germany) coated 8-well plates. Using the ibidi-Heating-System (ibidi GmbH, Germany), the microscope camera DS-Fi1 (Nikon, Japan) and the software “micro trac” (PD. Dr. D. Dirksen, University of Muenster), the movement of cells was displayed with 2.5 times magnification. Micromass formation of subcutaneous, visceral and omental fat tissue derived cells was displayed by the software “MicroTrac”. Every 5 s a picture was taken to work out the individual cell movement (Fig. 1). Subcutaneous fat tissue derived cells started to congregate after 3–5 min in order to form a spherical shape. The centre of gravity was located on every point of the well (Fig. 2). After 45 min of condensation the mean diameter of all cultures measured was nearly 1390 μm. The condensation process continued until a compact micromass culture with a mean diameter of nearly 471 μm had been formed (after 15 h). Visceral (Fig. 3) and omental (Fig. 4) fat tissue derived cells showed similar properties in comparison to subcutaneous ones, which was also revealed by cell tracking analysis. 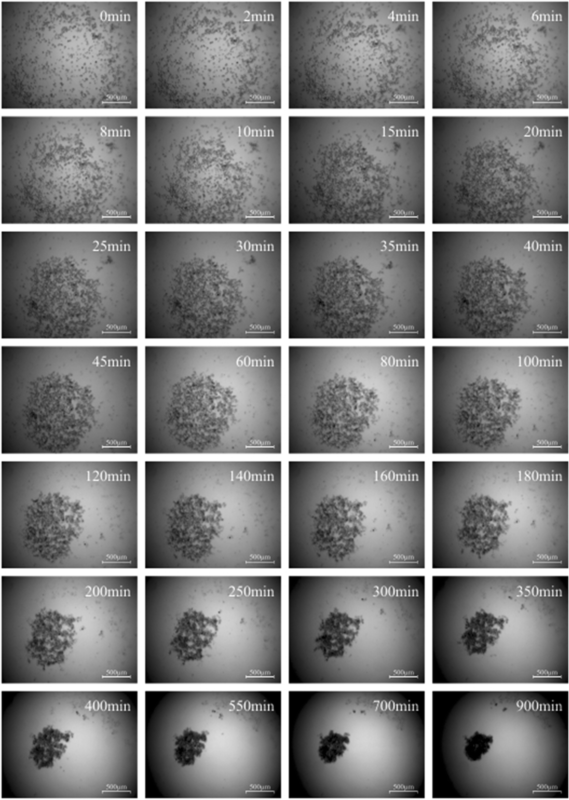 Within 45 min the majority of cell movement took place as cells formed a micromass culture with diameter averages of 1350 μm for visceral and 1476 μm for omental tissue. 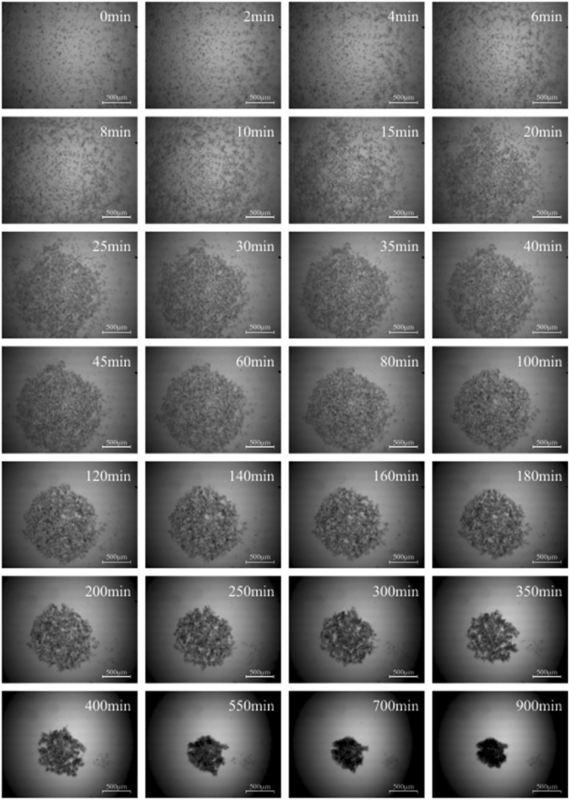 After 15 h, the condensed spheres diameter measured 400 μm for visceral and 493 μm for omental cells. The cell velocity and the cell’s distance to the centre of gravity decreased gradually. The cell movement compared to timeline is displayed in Fig. 5: the mean velocity of micromass formation (Fig. 5a) as well as the mean distance to center of gravity are shown (Fig. 5b). Most of the cell movement took place within the first 45 min, while all cell types showed nearly equal properties: cell velocity, which was very high initially, decreased continuously (Fig. 5a). The cells distance to the growing micromass centre (centre of gravity) is shown in Fig. 5b. Cells of all types of fat tissue congregate over the shortest possible path in order to form micromasses. HE-Staining showed a homogeneous cell quality in subcutaneous fat tissue derived cells (Fig. 6). In the peripheral area the cells were compressed resulting in a higher density and reducted size whem compared to the centre. Deviating from this, micromasses consisting of visceral and omental cells fat tissue derived cells showed other included cell types and air locks as well. Both types were not as compact and homogeneous as spheres consisting of subcutaneous fat tissue derived cells. All the micromasses cultivated for one week showed an oval or round form. Mean diameter of round spheres were 1000 μm and for oval spheres 800 to 1200 μm. 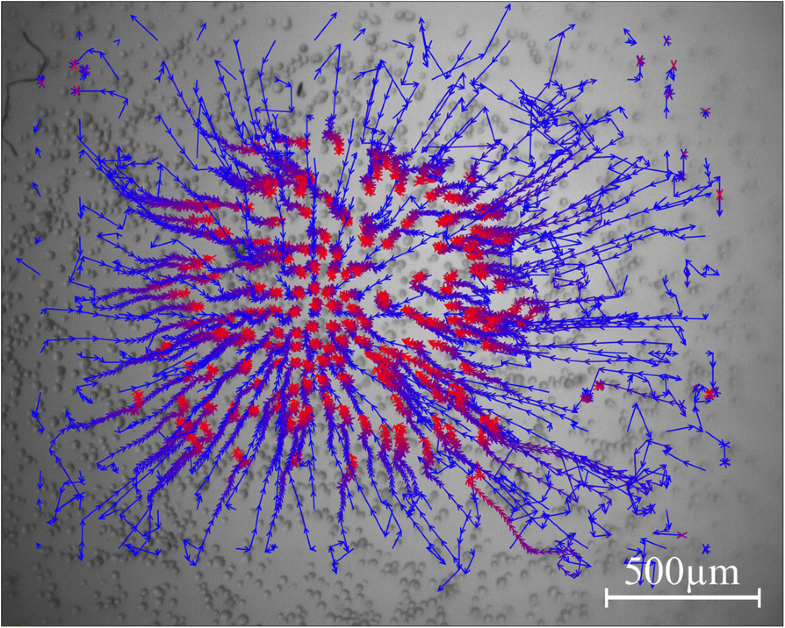 After seeding 7 day old spheres on collagen membranes, cells started to attach to the surface (Fig. 7). No differences in compound structure were observed between the three fat types hADSC. Within the following weeks the micromasses absorbed into the collagen membrane, while a spreading out of cells was visible after 5 days (Fig. 7). Spheres were totally absorbed into the collagen membrane after 14 to 28 days with the shapes of the spheres still being observable. Changes in expression of CD44, CD90, and CD13 of ADSC microspheres on collagen membrane were analysed with IHC staining and a semi quantitative score was defined. The results were summarised in Table 1. One way ANOVA was accomplished and differences were analysed on a level of significance of p < 0.05; referring to score of CD44 with a p-value of 0.0044, referring to score of CD90 with a p-value of 0.046, and referring to score of CD13 with a p-value of 2.9 × 10− 6. Also a PostHoc test was performed. 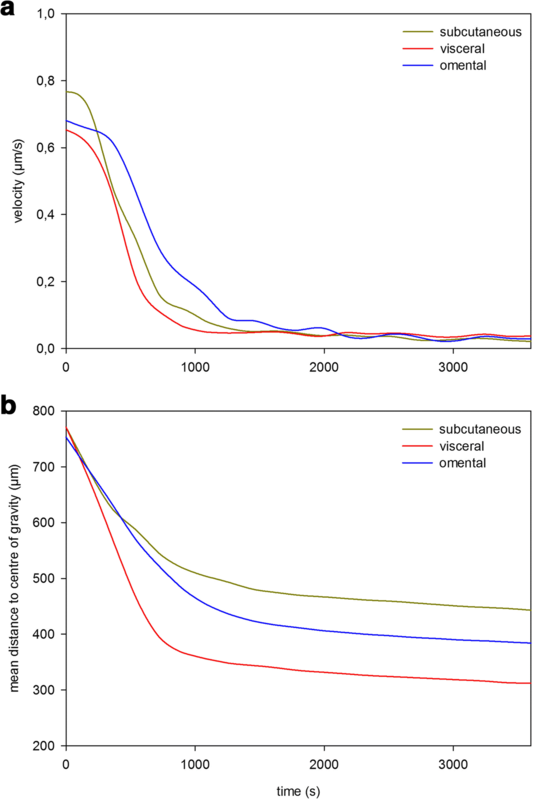 There were significant differences for CD44 between omental and visceral cells (p = 0.0085) such as between omental and subcutaneous cells (p = 0.002). Furthermore, a statistical differences was found for CD13 between subcutaneous and visceral cells (p = 5.23 × 10− 5) and between subcutaneous and omental cells (p = 1.7 × 10− 4). The expression of CD44 decreased gradually in hADSC micromasses of all three fat types. After 28 days, it was no longer expressed in hADSC derived from omental fat (Tab. 1). The expression of CD90 also decreased in time, but it was detectable after 28 days. Also the expression of CD90 increased during the first weeks in hADSC micromasses derived from subcutaneous and visceral fat (Tab. 1). The expression of CD13 remained constant with slight fluctuations (Tab. 1). In the current study, hADSC micromasses were plated onto membranes of collagen, which is a naturally produced protein in the organism. Previous studies showed various types of stem cells seeded onto collagen membranes as a prospective approach in tissue engineering. [28–30] We showed that there are no differences in miscellaneous fat tissues. As a result, we consider subcutaneous as well as visceral and omental derived cells a promising material for the treatment of tissue defects. The observed spreading of cells into the surrounding tissue highlights the high biological activity of this scaffold-cell-complex. Regarding to the formation of an environment similar to the physiological one, the micromass technique appears to be not only an insightful visualisation of cellular processes within living tissue, but also an auspicious prospect in the therapy of tissue defects. Hence, due to the differentiation capacity of hADSC their use seems to be particularly promising to generate damage tissues. Our findings revealed morphological differences in hADSC micromasses with subcutaneous fat tissue derived cells showing optimal results, but displayed similarities in formation process and ability to adhere to a biological surface like collagen. 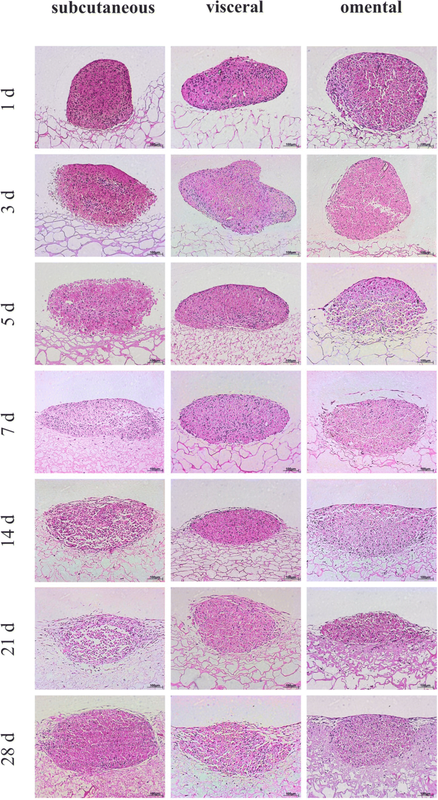 Although further investigations in animal models are required, these similarities may support existing theories of ADSC based regenerative concepts, which could potentially be applied in autologous tissue regenerating. Surgical procedures are often accompanied by hard and soft tissue-defects. For its repair, we presented three types of fat tissue as a multipotent stem cell reservoir. Micromasses in combination with a scaffold like collagen presents a solid, robust, and good manageable cell conglomerate to fill-out tissue defects. Micromass formation of all three analysed fat tissues could be achieved. Formation process was similar between fat types and observed differences were slightly. Micromasses of all three fat types adhered to collagen and were incorporated into collagen matrix. Expression of stem cell markers common used in hADSC changed during cultivation. These are first hints for a beginning de-differentiation of hADSC. In conclusion, hADSC derived from subcutaneous fat tissue appearing to be the best material for regeneration concepts. This study was supported by Professor Senninger, Head of the Department of Visceral Surgery (University Hospital Muenster) and Dr. Dirksen, Head of the Department of Dental Technology and Materials (University Muenster). We also thank Mrs. Segbert (AG VABOS) for her assistance in cell culture workflow and Mrs. Dehmer-Möller (AG VABOS) for her assistance in histology workflow. There were no third-party funds for this study. BK, SS and SJ made substantial contributions to conception and design of the article and drafted the manuscript. MH was involved in the acquisition and interpretation of the data and in revising the article. JK led the experimental part and revised the manuscript. All authors read and approved the final manuscript. Study design and disposal of left over human fat tissue was approved by ethics committee of medical association of Westphalian-Lippe and the University of Muenster (approval from: 23.08.2011). The ethics committee had no ethical or juridical doubts about the use of left over human fat tissue. Fat tissue was obtained after consent to participate under sterile conditions by the General and Visceral Surgery, University Hospital, Muenster (Germany). Kapur SK, Wang X, Shang H, Yun S, Li X, Feng G, et al. 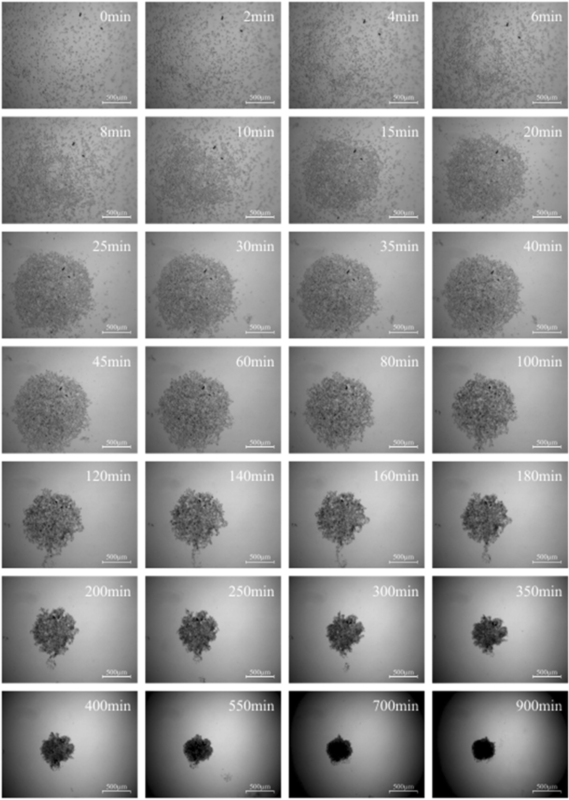 Human adipose stem cells maintain proliferative, synthetic and multipotential properties when suspension cultured as self-assembling spheroids. Biofabrication. 2012. https://doi.org/10.1088/17585082/4/2/025004.